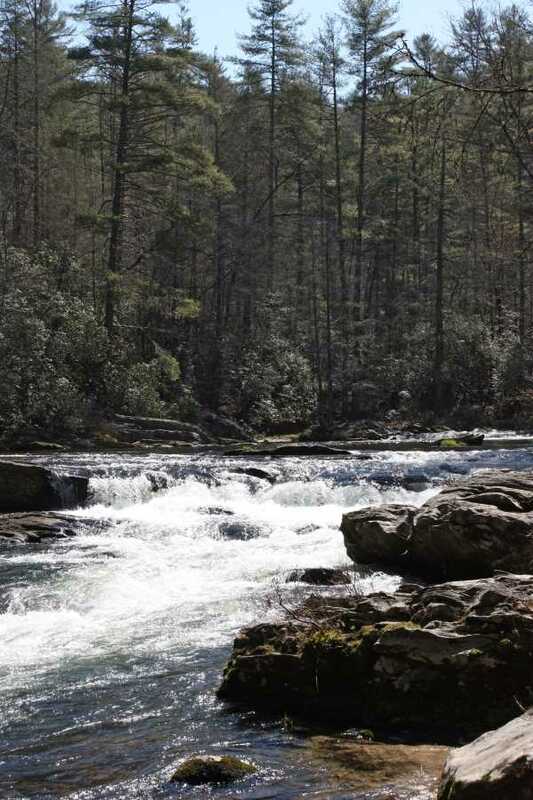 An easy to moderate hike, the Big Bend trail provides access to the beautiful Chattooga River and Big Bend Falls. 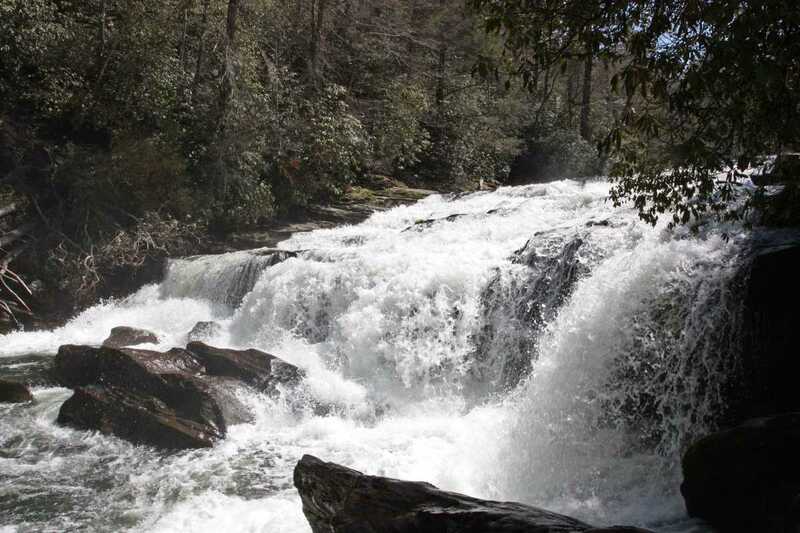 Hiking the 6.6 miles roundtrip to this remote river and falls are definitely worth the trip and shouldn’t be missed. A small parking lot for 4-5 cars is directly across the highway from the Big Bend trailhead at the northern trailhead for Winding Stairs. Either park here or at the slightly larger gravel lot at the entrance to the Cherry Hill Recreation Area just .1 miles north on SC-107. The trailhead is on the West side of the highway, designated by a trail marker. 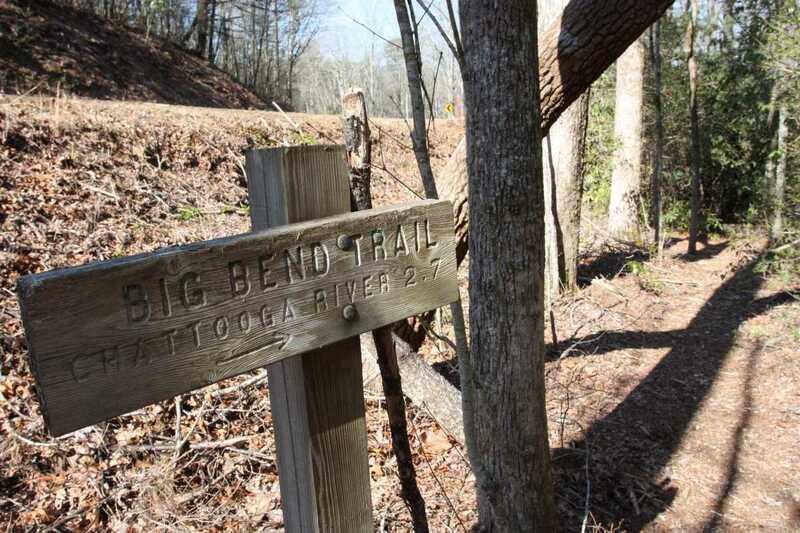 A couple signs here inform hikers of the distance to the Chattooga River. 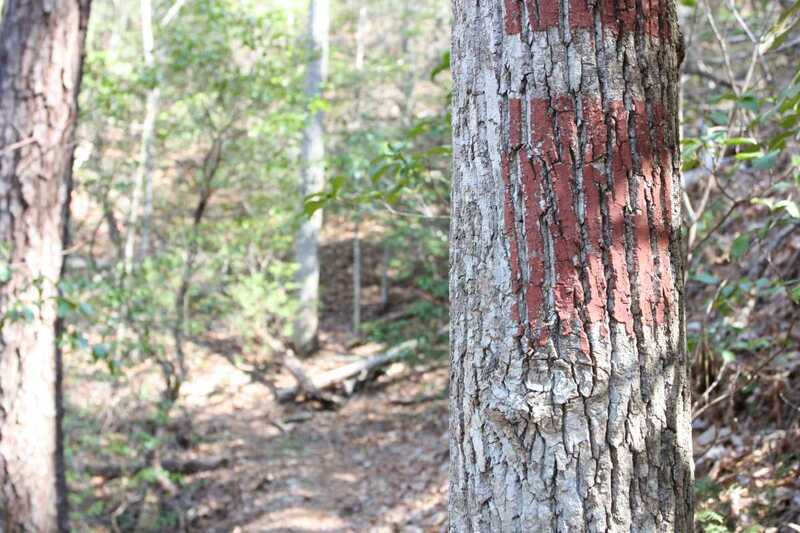 Although the trail is blazed, it is infrequent and difficult to see the faded red/rust colored markings. These usually show around intersections. 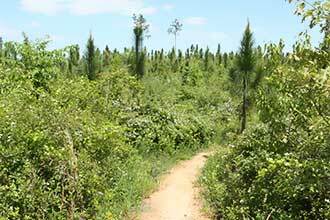 Other than a couple road crossings, this trail is easy to navigate. 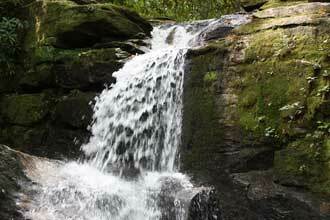 Hike down to a small stream before crossing it and gaining elevation, following the contour of the hills. 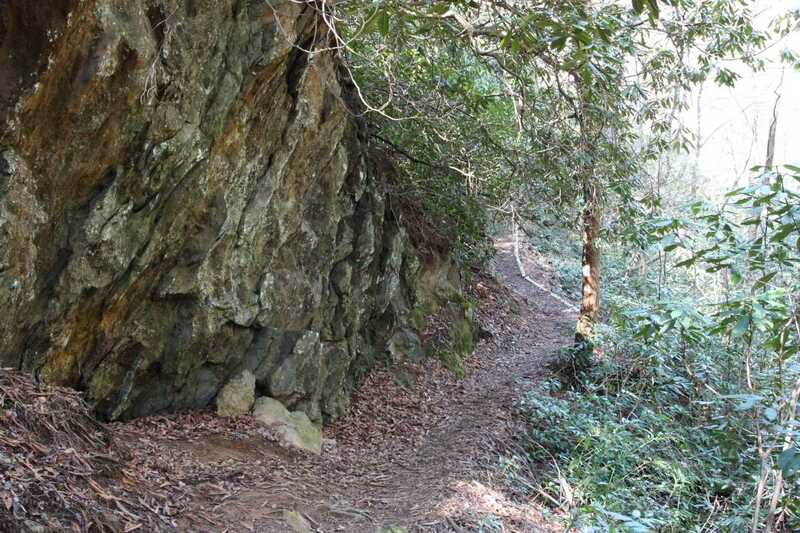 The trail roughly parallels Big Bend Road, coming into close contact with it at several locations along the first half mile. 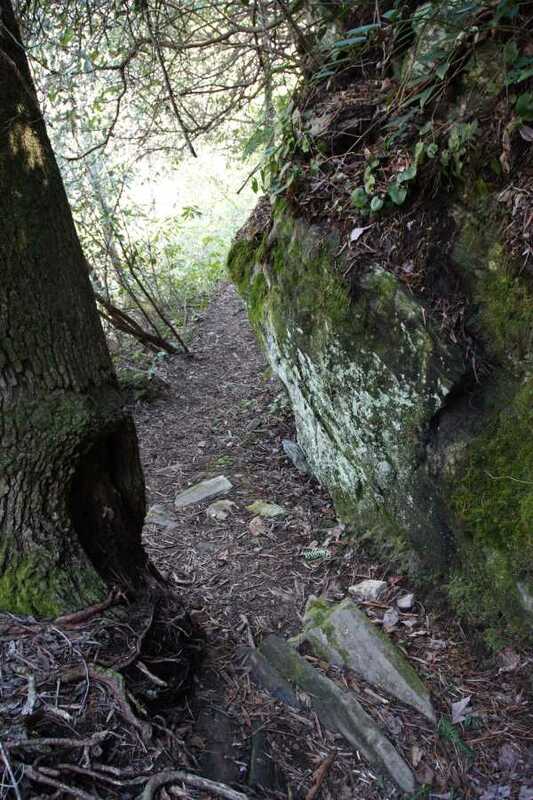 In many sections along this hike, the trail becomes narrow and drops off steeply. 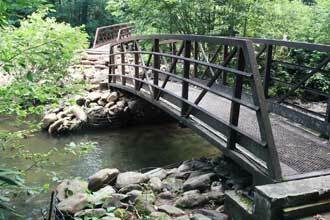 Crossing several footbridges, you will eventually arrive at an old road crossing at mile 1.6. Continue straight, again the blazes return shortly to confirm you are on the right track. 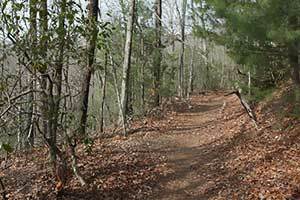 In another .5 miles, cross a second road/trail which provides quicker, yet steeper, access to the river below. 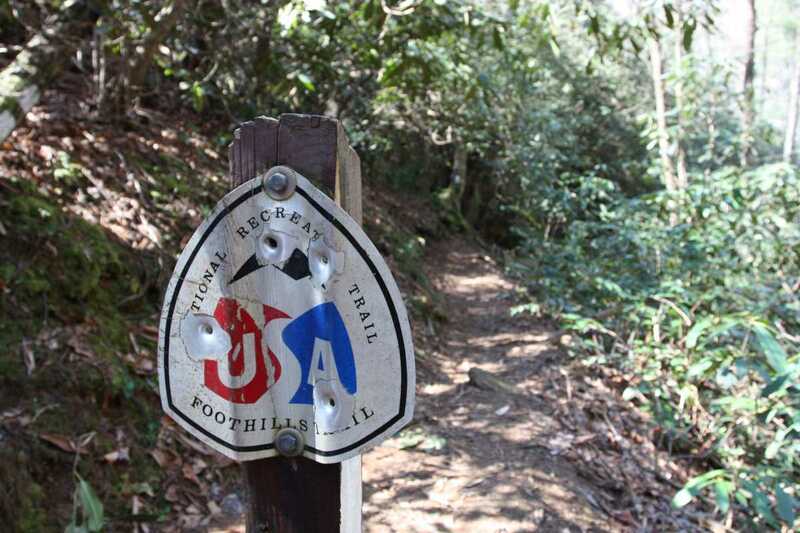 Again, continue straight, making your way down to a smaller stream and the intersection with the Chattooga/Foothills trail and the end of the Big Bend trail. 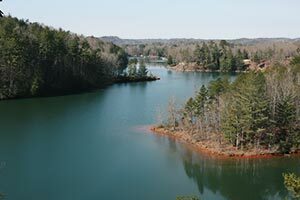 As before, continue straight instead of the across the bridge to head south along the Chattooga following the white blazes. 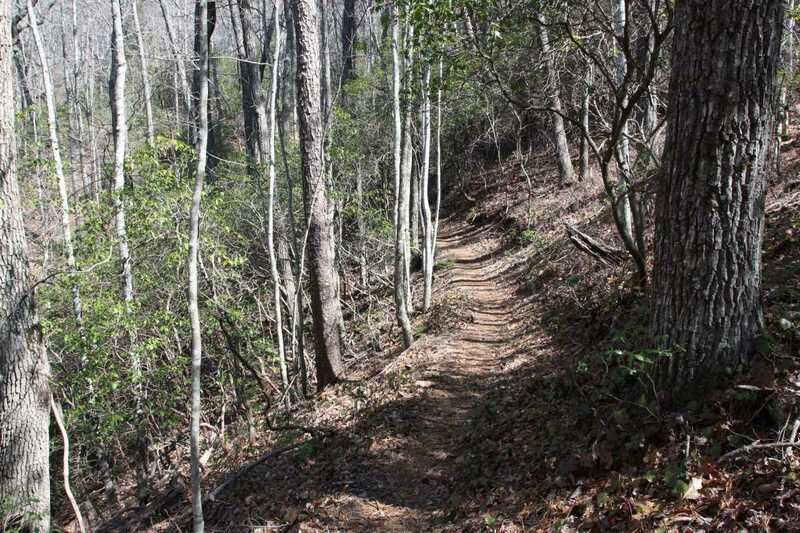 This section of trail is drastically different than the Big Bend trail, hovering both above and near the beautiful Chattooga River. 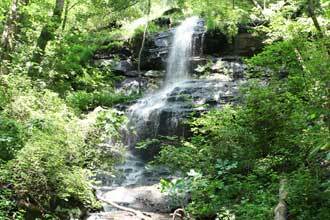 The air is dense and cool as you hike along rich dark earth, thriving moss and other vegetation. Go straight through the intersection with the previous steep road/trail crossing as it intersects the trail again on its way down to the river. 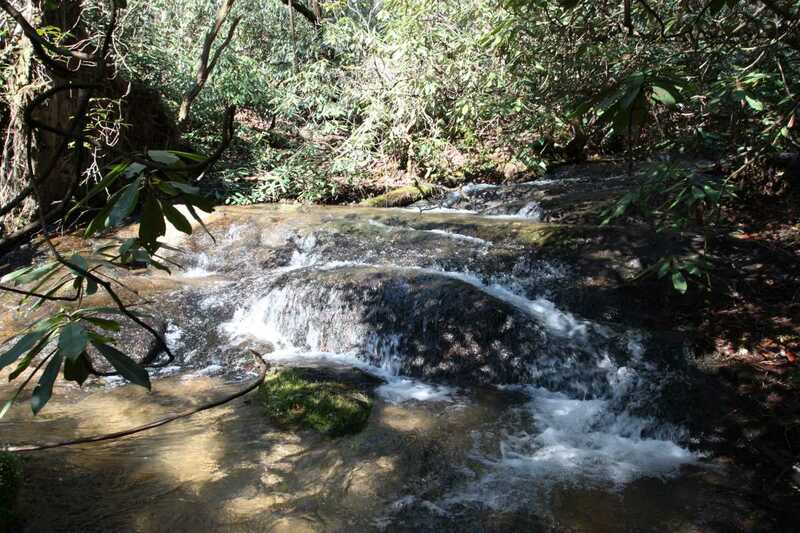 At mile 2.9 when the trail takes you close to the river, check out the short side trail leads to a view of a smaller cascade from several large rocks. 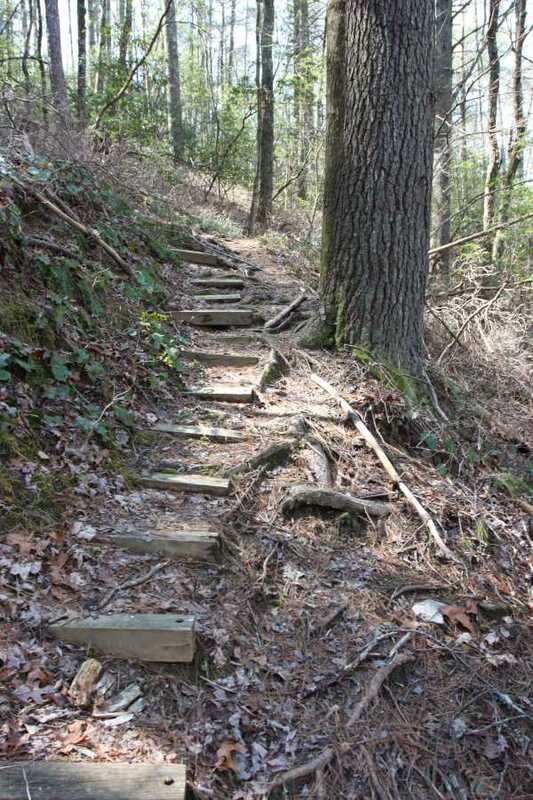 After travelling .6 miles along the Chattooga/Foothills trail, you will descend a set of rock steps to a side trail, which will lead down to Big Bend Falls. This is only suggested for those who do not mind getting dirty and being able to climb on hands and knees down the steep slope. 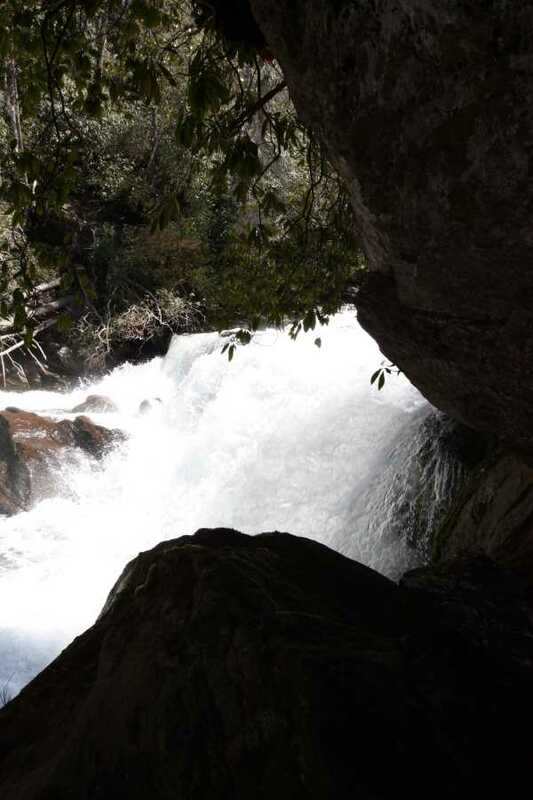 A small rock outcropping provides a view above the falls and if you climb down wet rocks and slick roots, you can get to the base of the falls underneath the rock outcropping. The rocks down here are extremely slick even if they do not look wet, so take appropriate caution. Park either at the small lot immediately off the highway or just north of the trailhead at the Cherry Hill Recreation Area. 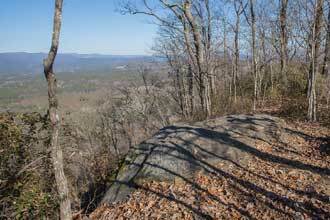 There are several sections of trail with steep drop offs. 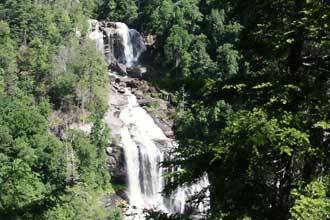 If navigating down the side trails for a better view of the falls, use extreme caution. 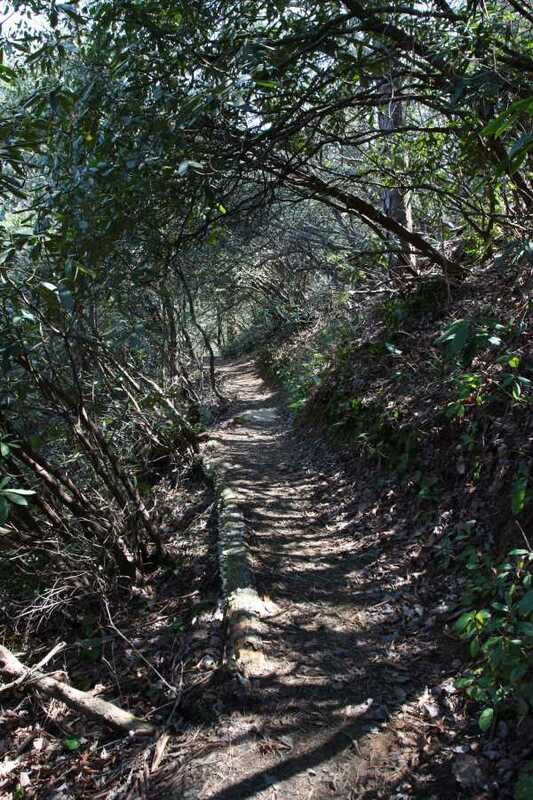 These trails are steep and can be covered in mud. Most rocks near the river a wet and slick. This is not recommended for anyone that does not feel sure-footed and does not mind getting dirty. 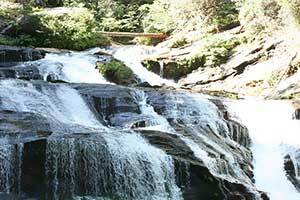 Once on the Foothills Trail you'll follow close along the beautiful Chattooga River and combined with the powerful Big Bend Falls makes this an excellent hike. Most of the difficulty comes from the length.